We’re thrilled to introduce our new Slack integration that allows you to crowdsource questions and ideas from your team without the need to leave your favorite workplace messaging app. There’s no doubt that Slack has become the lifeblood of internal communication for the world’s most innovative teams and companies. There are now over 8 million users across more than 500,000 organizations that use Slack to get work done every day. Since launching in 2012, Slido helped to engage millions of participants at over 140,000 events. The integration with Slack is the next step as we embark on our vision to transform the way meetings are run around the world. And for that, it is important that we meet our customers where they’re already working. Many of our existing customers today, such as Zendesk, Twilio, and WeWork use Slack to bring all their team communication and different tools they use into one place. Here’s what you can do with Slido in Slack today. A great Q&A begins before you gather in the room. Start collecting questions in advance to give both your managers and employees time to prepare for the Q&A. 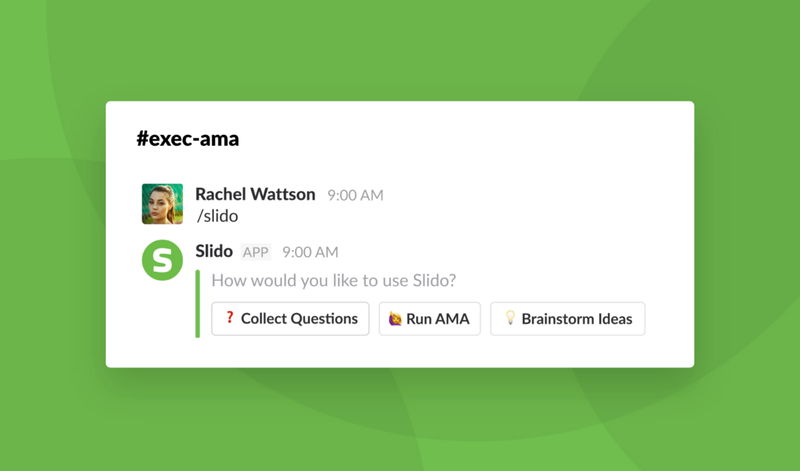 You can start instantly with the /slido slash command in a chosen channel and your colleagues will be able to submit their questions directly from Slack. There’s always the option to send questions anonymously, which means that you can remove the fear of asking questions and eliminate any bias. Your colleagues will decide which questions you should address during the meeting by upvoting their favorites. As a result, you’ll enable more effective conversation at your all-hands meeting while keeping the team engaged. Designing a space where your employees can ask their questions and the leadership responds is imperative to building a transparent workplace culture. Create a channel like #exec-ama (AMA stands for ‘ask me anything’) for the executive team to field questions from team members. You’ll know instantly about new questions and will be able to collaborate with the relevant leaders on their responses. Once answered, you can post replies to the top voted questions back to the dedicated AMA channel to share with the whole team. Whether you’re brainstorming your next company strategy or simply collecting ideas for your next team offsite, you make smarter decisions when leveraging the power of the crowd. Using the /slido slash command in any channel or direct message, you’ll be able to instantly start crowdsourcing ideas to solve a specific challenge. At Slido, we often use this feature to co-create a meeting agenda or to crowdsource highlights from the team to remind people of their achievements and positive results. In the meeting, we go through the ideas together, encouraging people to upvote the ones they like the most. It allows us to easily identify the best ideas and open a discussion as to what the next steps should be. Slido brings to Slack an easy way to capture and address your team’s most burning questions, making sure your people can stay engaged and productive. Learn more about the integration and how you can build it into your workflow at slido.com/slack-integration. We’d love you to give it a try and let us know what you think. You can ask us any questions on Product Hunt or hit us up on Twitter 👋. If you’re in the Bay Area, join us on Thursday, May 24 for the launch party and a fireside chat with Jim Ray, Enterprise Developer Advocate at Slack. Register here to save your spot.